Bobby Tait (Inside Forward, 1911-22) - Glenbuck Cherrypickers, gave Bobby Tait his start in football. He came to North End Park from Motherwell and played a vital role in transforming Cowden from a struggling side to Division 2 champions in just a few short years. Tait was a wily, skillful, little player and won numerous medals in what was one of Cowden's finest ever eras. He was renowned as the best ‘trapper’ of a ball in Scottish football. In 1916, Bobby joined up. 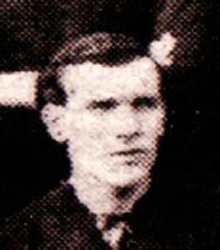 On his return in 1919, Bobby was appointed club captain and skippered the Cowdenbeath side which reached the Qualifying Cup final. He had a brief spell then with Lochgelly United before finishing up back at Cowdenbeath. Cowden rewarded him with a benefit match at Central Park v Celtic. In retirement, Bobby opened up a tailor’s business, in Stenhouse Street, played for Cowdenbeath Wednesday, and was one of the trustees of the Cowdenbeath Football Trust which revived Cowden after the War. Bobby died in Cowdenbeath aged 64 in 1950.